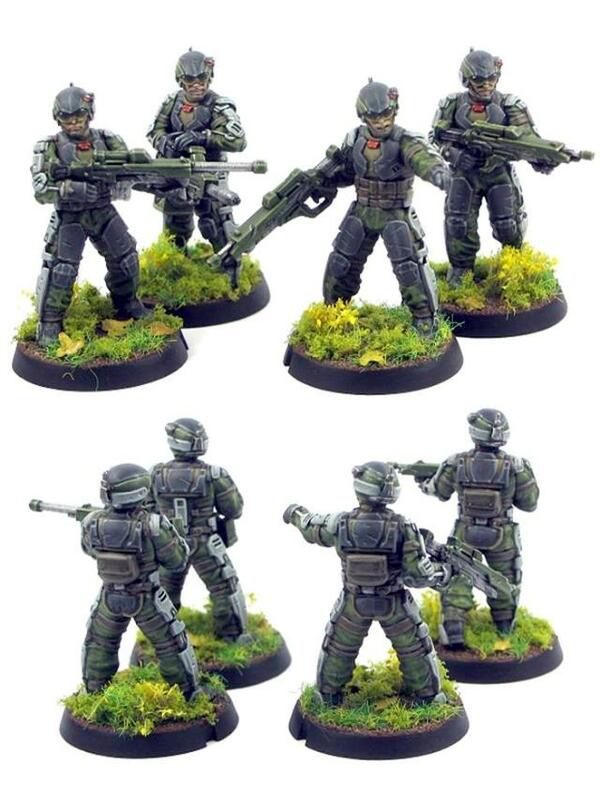 Containing 6 models on 2 plastic sprues with a great range of options, this pack allows you to build an Epirian SecDef squad. Each sprue (2 copies) contains: 3x heads, 6x legs, 3x torso, 5x gun options, 10x arm options, 2x weapon braces. This fully plastic kit allows you to build a squad of the Epirian's elite fighting force - the SecDef. The elite of the Epirian Foundation is the Security and Defence force, or SecDef. The men and women of SecDef are better trained, better armed and better equipped than the Contractors that make up the majority of Epirian defences on frontier worlds. SecDef take only the very best recruits, typically recommended by a trustee after a number of years of dedicated service as a Contractor. Those promoted into SecDef spend over a year training at dedicated off-world bases on Foundation worlds throughout the Spiral Arm, where grizzled veteran instructors inflict a brutal schedule of combat, security and fitness drills. Many recruits wash out during this gruelling period of indoctrination, and only the best of the best become members of the SecDef's feared infantry squads. The Foundation likes to play up this robust selection and training system, because the SecDef are a source of both great pride and great profit. The SecDef are billed by their corporate owners as the ultimate in precision combat. Even one SecDef squad is a honed killing machine, clinical and effective. Rich companies and individuals alike across the galaxy look to hire SecDef infantry as the finest mercenary units, working as bodyguards, military escorts or even leading attacks on rival corporations or hostile alien worlds. In the days before the Maelstrom, the Foundation was a loose affiliation of corporate franchises, competing on designs for robotics and terraforming technologies, and for the rights to mine asteroid belts and transform worlds for new colonies. However, the franchises recognised the need to keep their free market competition civil and productive, and the elected Foundation trustees maintained the trading rights and regulations between franchises, as well as mediating disputes and deciding on the overall direction of the Foundation. The SecDef acted as the enforcement arm of the overarching corporate structure, a hand-picked selection of the best soldiers from across the different franchises, trained up to be the best equipped and trained fighting unit in the corporate sector. Because of this need for independence for the franchises, the SecDef eschewed the use of robots, as these might preferentially benefit an individual franchise. In the time since the Maelstrom, communication, transportation and above all trust across the Spiral Arm has disintegrated, and the Foundation has fragmented into individual franchises, each with their own SecDef division. Despite now being in more direct competition, much of the tactics and philosophy of the original SecDef charter remains in the individual organisations. The number of soldiers employed in SecDef varies from franchise to franchise, but is typically much lower than the number of Contractors and robotic units. Most franchises like their security and military forces to be represented by robots, acting as a sales tool for the consumer models of the robots seen on the battlefield. However, robots are only as effective as their Bot Handler. With armed conflicts erupting across the Spiral Arm due to the constant threat of the Maelstrom, Foundation forces more often find themselves having to make do with fewer and less well trained Bot Handlers. SecDef forces are therefore often kept in reserve and used to clean things up when the robotic and Contractor units get bogged down or can't overcome a tough enemy. This gives the SecDef of certain franchises a reputation for saving the day, which the trustees utilise to charge even higher rates when the SecDef perform 'consultancy' work for other organisations. Their tough reputation and intense lifestyle means that most SecDef soldiers are much better paid than Contractors or even some Bot Handlers, but they are so in demand that when the contract of a veteran SecDef expires they will often offer themselves up to opposing franchises for better rewards, or even go completely independent, leading to some of the most cut-throat and effective mercenary forces in the galaxy. The SecDef's weapons and equipment are traditionally manufactured by Araldyne, one of the last great Epirian Foundation franchises. Araldyne were the franchise with operational control over the Foundation just before the Maelstrom hit. Ever since, Araldyne has maintained that they should rightfully be in control of the entire Foundation, and use both political pressure and military force to seize ships, technology or even planets from other franchises, insisting that they do so for the good of the Epirian Foundation as a whole. Their weaponry is more expensive and advanced than most used in the Foundation, prioritising advanced design and optimised technology over the mass-produced weaponry used by much of the Foundation's lesser troops. SecDef infantry are typically seen sporting powerful Araldyne AR60 assault rifles, as well as the heavier models in the Araldyne range such as the LM14 Machine Gun, SR40 Sniper Rifle and CG100 Chaingun. Such is the prevalence of Araldyne technology amongst the SecDef that rumours abound that Araldyne is secretly funding them as part of their goal to take over the Foundation. As a result, some of the more independent Foundation franchises such as the isolationists of Arkacorp refuse to accept Araldyine support for their SecDef, and even manufacture their own inferior copies of the Araldyne equipment. To their chagrin, despite these imitation weapons being more common across the Spiral Arm, they are still called 'Araldyne'-type weaponry, due to the obvious imitation of their competitor's designs. Many of the higher-ups in the Foundation dislike that the elite forces of the SecDef are human-based, and there is pressure from some business units to disband SecDef and replace it with robotic divisions. The reality is that the human faces of the SecDef perform a function that robots cannot, and so there is a lot of pushback from Foundation military leaders whenever the commercial arm suggests a robotic replacement. This internal conflict gives the soldiers of the SecDef a huge chip on their shoulder, and pushes them not only excel at their jobs but also to resent Foundation robotic units. As a result, SecDef units refuse to include Foundation robots within their detachments, and never miss an opportunity to remind Bot Handlers and Contractors alike that the 'real soldiers' saved the day when they are deployed to reinforce their positions. SecDef soldiers gladly utilise all the other technological advances of the Foundation's foundries such as power-assisted armour, advanced maglock weaponry and targeting assistance, as long as there is always a human in direct control of the weapon or vehicle. They also refuse to be transported by drone craft, and arrive on the battlefield airlifted in stealth-armoured, human-piloted Hornet dropships. An aerial insertion by a SecDef squad or detachment can be the sharp stiletto that opens up a stalemate and turns the tide in the Foundation's favour. A SecDef infantry squad is a well-drilled team of three to five elite soldiers, specialising in assaults on enemy space stations and secure facilities, as well as the defence of the Epirian Foundation's own high-value targets. A SecDef infantry squad will advance in synchronised cover formation, stepping individual squad members up to secure positions before allowing their team to advance. Their combat philosophy is to always keep moving, only staying in one location long enough to make an attack before shifting to a new position, constantly searching for a way to flank the enemy or find a weakness. They rarely deploy to fixed positions, and typically will be airdropped onto the precise location on the battlefield where they can make the most impact. The high-pitched scream of their Hornet dropships coming in for a combat drop is an ominous precursor to enemy combatants that in a few short seconds a SecDef squad will be on position to turn the tide of battle. SecDef soldiers wear augmented power-assisted exoskeletons, with servo motors boosting the power of their arms and legs. As well as enabling antigrav aerial insertions from high altitude, the exoskeleton also allows them to wear thick ballistic armour without losing full mobility or movement. Their helmets are equipped with state-of-the art targeting and threat-identification heads-up displays, which when coupled with their years of advanced training and experience gives them an unparalleled instinct for tactical action on the battlefield. SecDef infantry sport the most advanced maglock weaponry produced by Araldyne Systems. The superior craftsmanship and state-of-the-art materials in an Araldyne AR60 assault rifle or G20 pistol makes it lighter to hold and more precise, with targeting optics linked into their helmets and a more expensive deadlier armour-piercing round made from rare earth metals. A squad can be supplemented with sniper or machine-gun armed specialists for specific combat roles, whilst the SecDef Annihilator team, armed with 2 Araldyne CG100 Chainguns, is capable of taking on even the most heavily emplaced fortifications. The combination of intense training, advanced exoskeletons and cutting-edge weaponry makes the SecDef the finest fighting forces in the Epirian Foundation - or for those with the resources to purchase their services.